Fourth-year medical students try to peek inside their envelopes during the Match Day event on campus today. 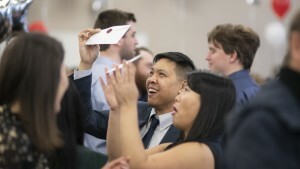 Members of the Chicago Medical School (CMS) Class of 2019 gathered for the annual Match Day rite of passage on March 15, joining thousands of fellow fourth-year medical students around the United States in learning where they will complete their residency training in their chosen specialties. CMS continues its strong record of match success with a 98 percent rate of placement, exceeding the 2019 national match rate of 94.9 percent. Students matched to top residency programs around the nation at hospitals and medical centers including: Johns Hopkins, Mayo, Baylor, Yale-New Haven, Harvard-MGH, Brown-RIH, Stanford, Washington, UCSF, USC, UCLA, Michigan, Ohio State, Icahn-Mount Sinai, as well as across Chicagoland: Stroger Cook County Northwestern University, U Chicago, UIC, Loyola, Advocate/Aurora, and many more, including a Canadian match at the University of Toronto. 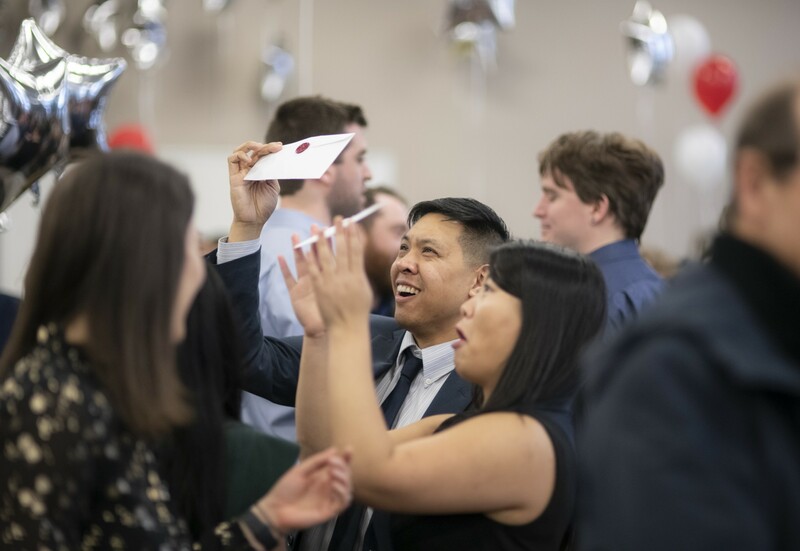 The CMS Class of 2019 graduates on May 31 during Rosalind Franklin University’s 105th Commencement Celebration, to be held in downtown Chicago.